Update: Thank you Carolina Plott Hound for linking! The News and Observer has an article up entitled, Pendleton, Hanchette seek Wake seat. The N&O does a brief write-up on both candidates but leaves out some critical information, like Hanchette’s Moral Monday arrest on June 10, 2013. Also, at the June 10th arrest, Hanchette tied herself to Equality NC by listing them as her interest group affiliation. Equality NC has endorsed Hanchette as well. Remember, Equality NC is also a Blueprint NC member; “Cripple, eviscerate, pressure and slam“. This isn’t the first time a candidate or the N&O has failed to present information about a candidate’s affiliations or background. She’s the Wake County Commissioner Candidate who has repeatedly failed to mention in her bio she is an NCAE attorney and has spoken at Moral Monday? 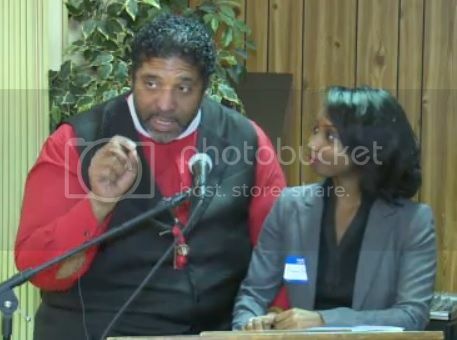 Is Moral Monday leader trying to disenfranchise voters? 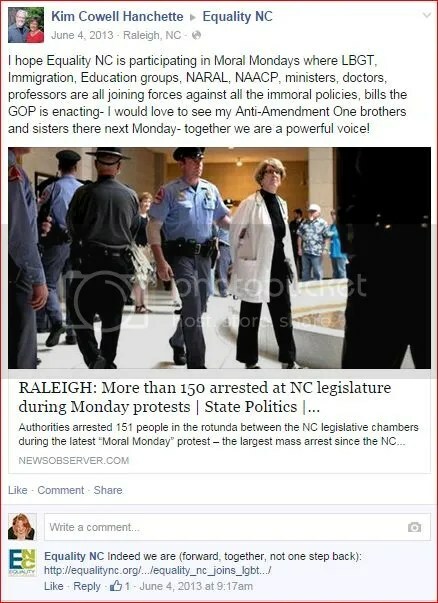 This entry was posted in ELECTIONS, LL1885, Media Bias, Moral Monday, NC Dems, News and Observer, The Articles and tagged Jessica Holmes, Kim Hanchette, NC49. Bookmark the permalink.